My Tylenol bottle thinks I drink too much. Well, it's not every day that I drink three or more beers, but I drink some amount of beer most every day, and if I have one I usually have two. And, like anyone who likes to drink, I sometimes have way more than three. It's great fun to make liver jokes -- the liver is evil, must be punished -- but I have a feeling that liver failure wouldn't be much fun. We all know that chronic alcohol abuse is bad for the liver. But did you know that acetaminophen poisoning is the most common cause of acute liver failure in the US? Apparently the recommended daily maximum dosage -- which the FDA is about to lower -- is only about half of the dosage that starts to overwhelm your liver, and the way over-the-counter remedies sprinkle in a little of this and a little of that can get some people over the line without them even thinking about it. The combination of alcohol and acetaminophen can have immediate bad effects on the liver. First thing to remember: do not take Tylenol after heavy drinking. Like the next morning, when your head is pounding. I am not a doctor, but it looks like ibuprofen (Advil) is a safer bet for hangover help. Ibuprofen, like aspirin, is rough on the stomach -- take it with food. There's a place for each pain reliever, just don't combine alcohol and Tylenol. Furthermore, if you drink every day, only take half the maximum acetaminophen dosage (2 grams a day instead of 4 grams a day), even if you stopped drinking when you became sick. Here's a pretty good explanation of that, despite having been written by a lawyer. Tylenol has made my life bearable the last few days, with this damn flu I've got. I'm looking forward to getting back to some beer drinking, though. It's funny that you bring this up. My wife, a couple friends and I were having a conversation about this a few weeks ago...while drinking. My friend's mom is a nurse and she tells him all the time how Tylenol is the most dangerous over the counter medication you can take. Acetaminophen overdose is unfortunately a fairly common problem. People either don't realize how much they are taking or don't realize that it is shoved into all kinds of other medication like Vicodin or Percocet. Acetaminophen increases liver enzymes, which can lead to damage. In some people, the recommended doses is enough to push this increase to a dangerous level. There are also studies that show how long term use of Acetaminophen can decrease the kidney's ability to filter blood. If you can handle normal Aspirin it is supposed a much safer option. I myself use a pot of coffee and yard work. It seems to do the trick. I researched this issue last week after being prescribed Vicodin: The liver can process about 4 grams of acetaminophen in 24 hours; any more than that becomes toxic. 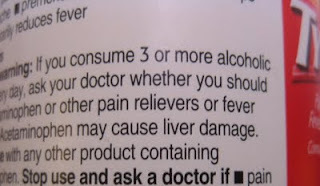 Alcohol taxes the liver enough to reduce the safe level of acetaminophen to 2 grams. You got a link for that 2g quota, Dave? I'd like to add it to the post. When I learned about this some years ago, I decided acetaminophen was just not for me. I've also learned that a good diet (necessary as I age) high in fruits and veggies mitigates a lot of the problems I originally needed these kinds of drugs. What's the story with ibuprofen, which, thanks to chronic sciatica, I take regularly. I hope it's kosher with beer. Ibuprofen does not thave the same harmful effects as Acetaminophen when used with alcohol, but according to this list of approved medications for 2009-2010, it does not appear to be kosher. Nice one, Kevin. But Motrin is on the list, so I guess if Jeff needs to keep Kosher in the religious sense he can switch to that for his ibuprofen. Jeff, my extensive 10-minute Google search only found aspirin-like stomach bleeding issues with ibuprofen. But you were probably already aware of that. As far as I can tell, there isn't a serious interaction with alcohol. Thanks-this is pretty helpful to read, given the cold+flu season being upon us. Wow, this scares me a little bit. So I guess it was a bad idea to wash down my Tylenol with a Sam Adams tonight.